Large room on the second floor bathed in natural light (3 windows). Oak Victorian bed (Queen), matching dresser and dry sink. Upholstered chair, floor lamp and closet. Antique sewing machine for decoration. Bath has claw foot tub with shower enclosure, toilet, and sink. Dark green wallpaper with light pink and white flowers. Large bright room on the second floor, at the front corner of the mansion. Three bay windows with window seat and cushion, plus two additional windows on the front. 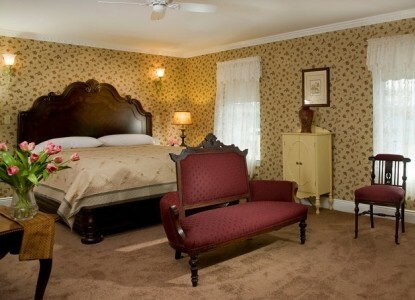 Features a painted ivory and brass bed (Queen), an antique armoire, a bedside table, and an upholstered slipper chair. The bath has sink, toilet, and shower. This large front corner room, located on the second floor, overlooks Wilbraham Park. Three large windows across the front and one on the side, all with wooden shutters. 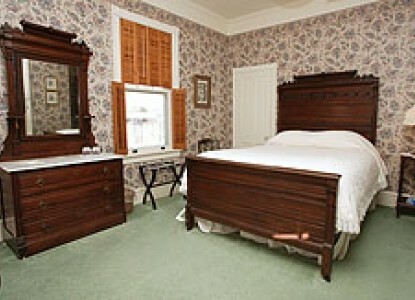 The bed is high backed mahogany (Queen) with a matching dresser. 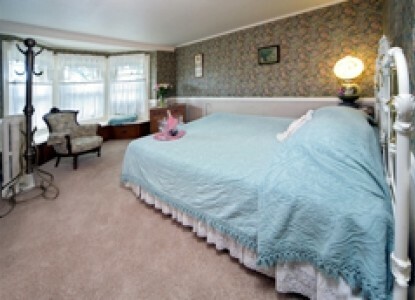 Also in the room are a settee, a straight chair, a small table and lamp beside the bed. Bath has sink, toilet, and shower. 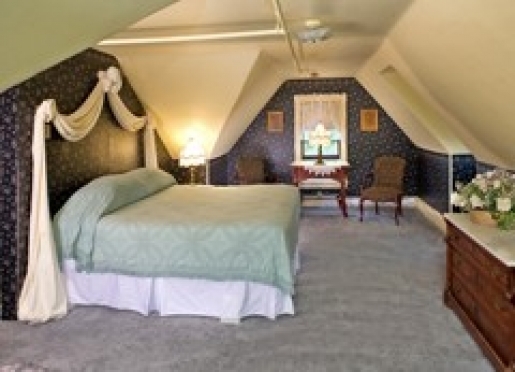 Our second floor suite has two rooms, with ceiling fan and bath with shower. 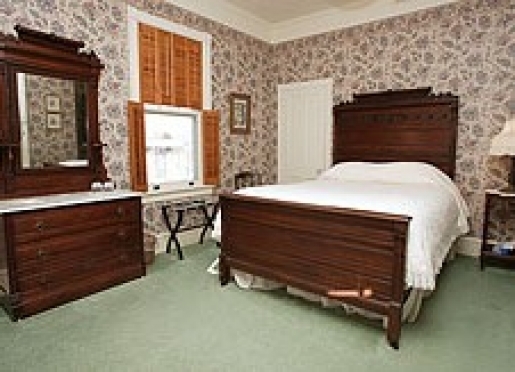 The bedroom has a lovely antique, high backed mahogany bed (Queen) and matching dresser. Above the bed on the wall is a blue moiré wall drape. 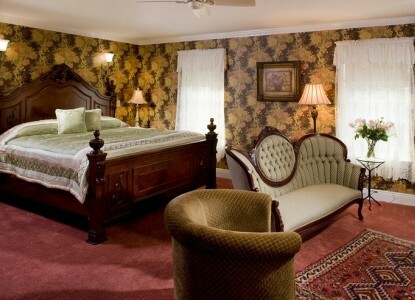 There is also an upholstered Victorian arm chair in the bedroom. In the sitting room are the Wilbraham Federal style chairs along with a tea table, lamp with mirror above and a dry sink. 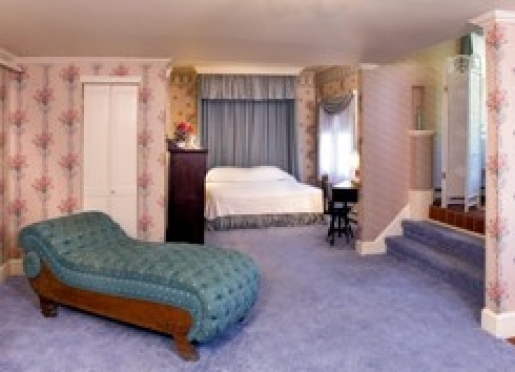 This extremely large suite is located on the first floor and has a king sized bed with ceiling wall hanging of blue moiré, matching curtain swags and dust ruffle. Lace curtains on the windows, antique chest of drawers, an antique dressing table and chair. One side of the suite has a raised alcove accommodating a two-person Jacuzzi bathtub. The newly renovated bathroom features new fixtures and tile, and a 5-foot shower with two showerheads. The closet contains a mini-refrigerator. 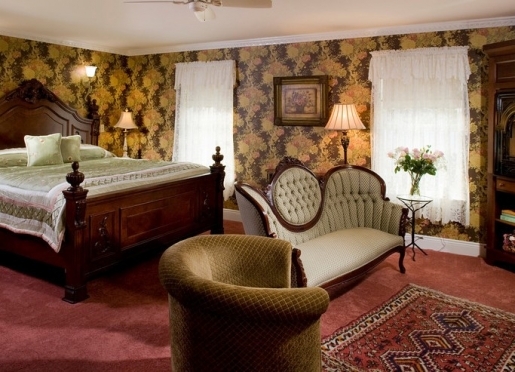 Across from the tub is a fainting couch and a tea table and lamp. At the opposite side of the suite from the bed is a Victorian sitting area with a settee, two chairs, three tables, and a corner cabinet. 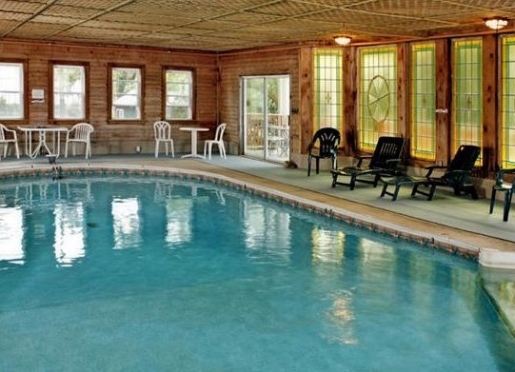 The suite has a private outside entrance and close proximity to the pool. 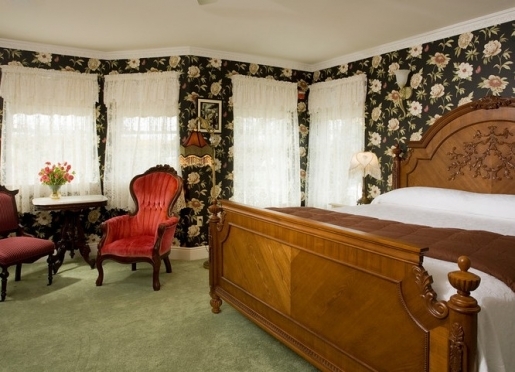 This large suite on the second floor contains a king sized, reproduction Victorian bed, matching armoire, and antique settee. The room is comfortably appointed with a corner fireplace, an upholstered chair, floor lamp, and several tables with lamps. The armoire has drawers at the base and an LCD TV with DVD player and satellite TV above. The closet houses a mini refrigerator. The bathroom features a two-person Jacuzzi Salon Spa tub with water jets, air bath, lights and heater, a vanity with matching mirror, toilet, and two-person, double headed shower. 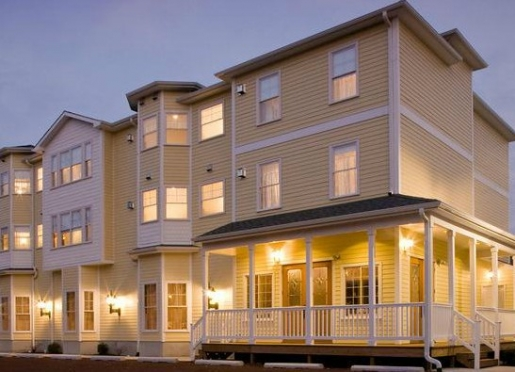 >This second floor oversized suite is defined by luxury. The room is filled with light from a bank of four windows. 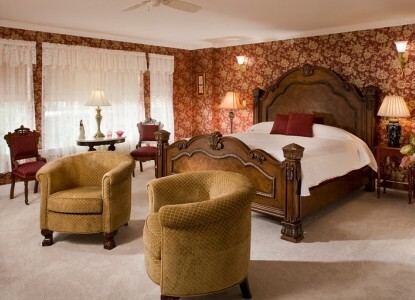 The wall covering is a rich red and gold flower print which is offset by the vanilla colored carpet. 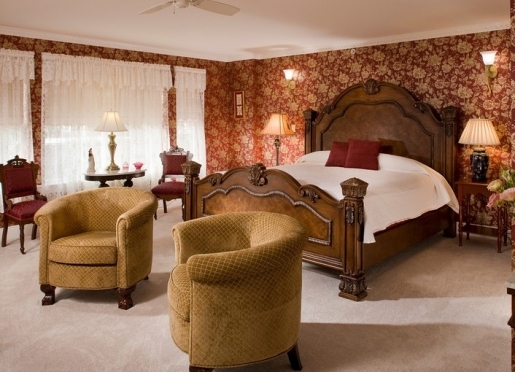 A king sized bed with matching armoire that houses an LCD TV with DVD player and satellite TV provide the basics. 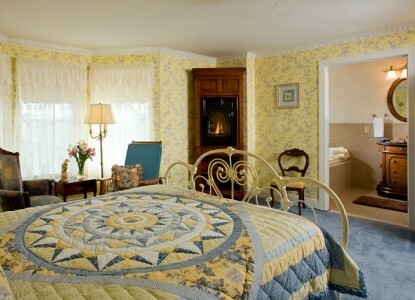 The room also features a corner fireplace, separate sitting area with comfortable upholstered chairs, two straight backed chairs with a marble top table, and ceiling fan. A double closet holds the mini refrigerator. The bathroom is the size of a small room and has its own bay window. The two-person Jacuzzi Salon Spa tub with water jets, air bath, lights and heater, double vanity with matching mirror, toilet, and two-person, double headed shower provide ample opportunity for pampering. The bathroom is large enough to host in-room spa services, if desired. This suite has it all! 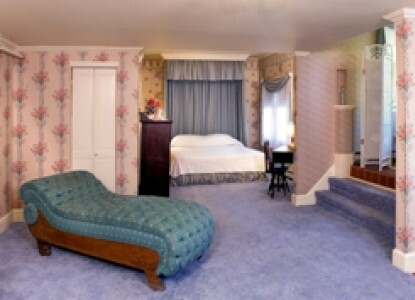 >This second floor suite has five windows that highlight the blue and beige patterned wallpaper. The suite has a king sized bed with matching armoire, LCD TV with satellite TV and DVD player, mini refrigerator and corner fireplace. 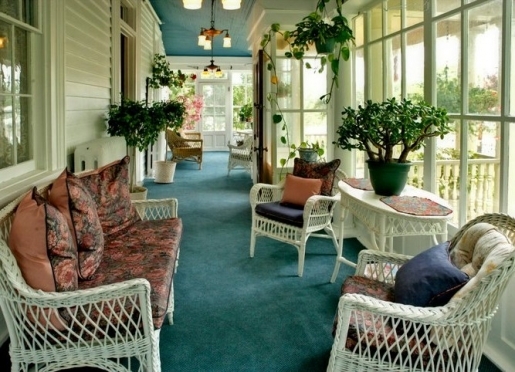 The sitting area has two upholstered chairs, a reading lamp, and an antique table of wood and glass. The bathroom features a two-person Jacuzzi Salon Spa tub with water jets, air bath, lights and heater, a vanity with matching mirror, toilet, and two-person, double headed shower. 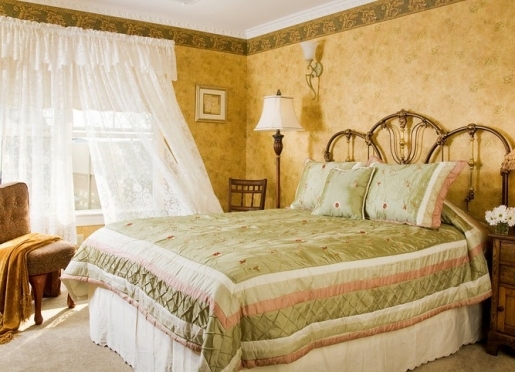 This second floor suite has a large bay window, aqua and beige patterned wall covering, and light beige carpet. 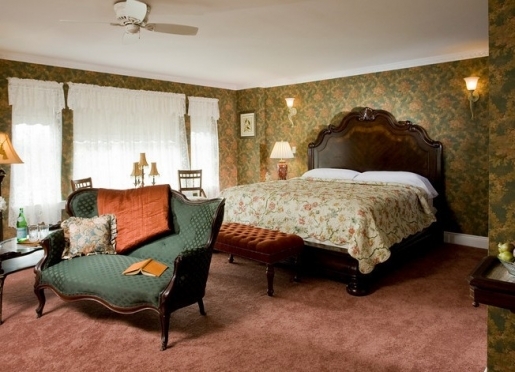 The queen bed has an antique brass headboard, and the bay window provides a sitting area with two chairs and antique wood table. The LCD TV with satellite TV and DVD player sit atop a chest of drawers, and a wood corner cabinet houses the fireplace. There is a mini refrigerator in the closet. The bathroom features a two-person Jacuzzi Salon Spa tub with water jets, air bath, lights and heater, a vanity with matching mirror, toilet, and two-person, double headed shower. 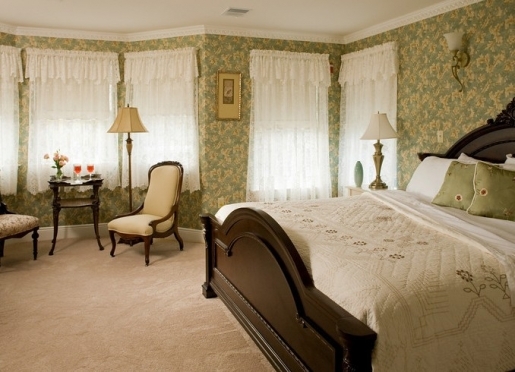 This queen suite on the second floor is decorated with a mustard hued patterned wall covering complemented by green border and carpet. 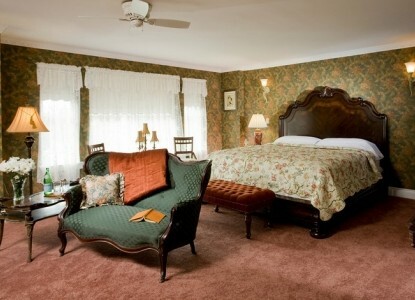 The suite has a queen sized painted bronze bed, upholstered chair, antique wood and glass table, floor lamp, bedside table and light, mini refrigerator and corner fireplace. The armoire base has drawers and the top houses the LCD TV with satellite TV and DVD player. The bathroom features a two-person Jacuzzi Salon Spa tub with water jets, air bath, lights and heater, a vanity with matching mirror, toilet, and two-person, double headed shower. The bathroom is handicapped accessible. This second floor suite has a light and airy quality. A bay window highlights the yellow and blue wall covering and carpet. The sitting area includes two upholstered chairs and a floor lamp. The bed side table is marble topped and hosts a two tiered light next to the queen sized bed with metal painted frame. The armoire has drawers in addition to housing the LCD TV with satellite TV and DVD player. The fireplace is situated four feet off the floor in a cherry wood corner cabinet. A mini refrigerator is housed in the closet. 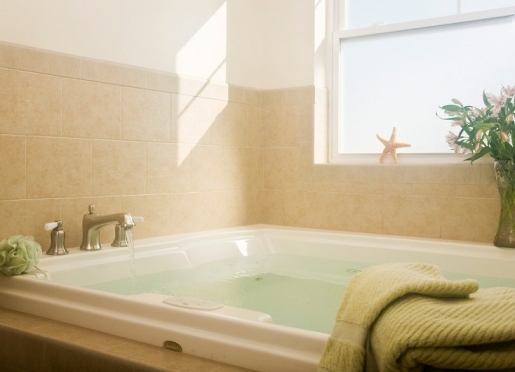 The bathroom features a two-person Jacuzzi Salon Spa tub with water jets, air bath, lights and heater, a vanity with matching mirror, toilet, and two-person, double headed shower. 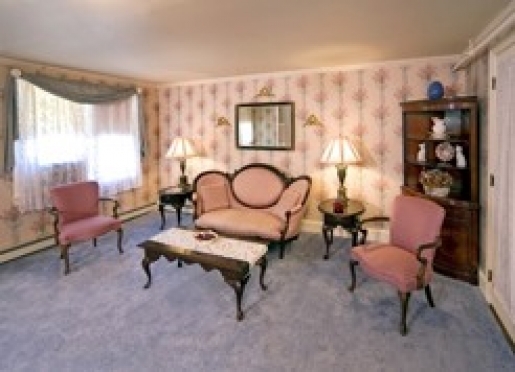 This large suite on the third floor has a tan and red floral wall covering with a dark tan carpet. 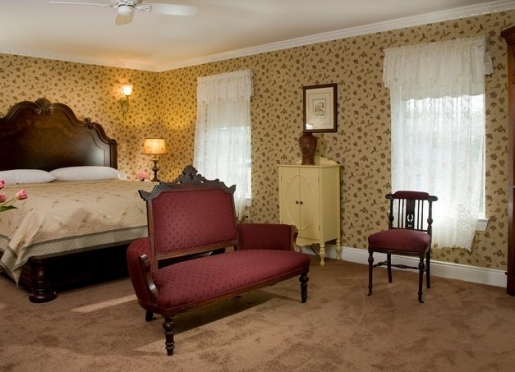 The suite features a king sized bed, matching armoire, and antique settee. 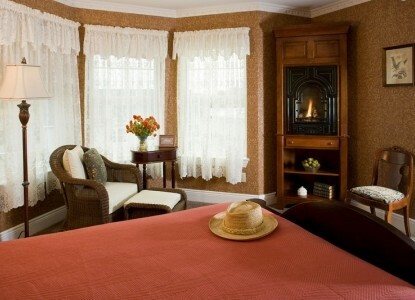 The room is comfortably appointed with a corner cabinet fireplace, an upholstered chair, floor lamp, and linen cabinet. The armoire has drawers at the base and an LCD TV with DVD player and satellite TV above. The closet houses a mini refrigerator. The bathroom features a two-person Jacuzzi Salon Spa tub with water jets, air bath, lights and heater, a vanity with matching mirror, toilet, and two-person, double headed shower. >This third floor oversized suite is defined by luxury. The room is filled with light from the bank of four windows. 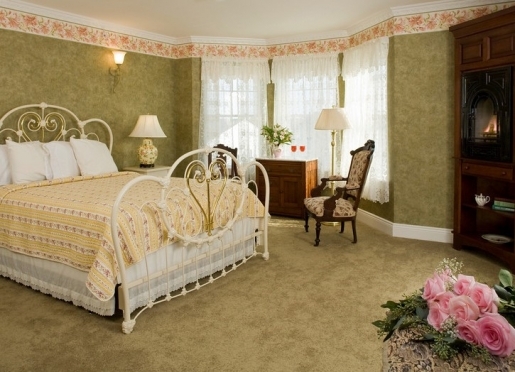 The wall covering is a deep green and rust colored floral pattern which is coordinated with a rust colored carpet. One side of the room has the king sized bed while the other side of the room hosts the matching armoire that contains an LCD TV with DVD player and satellite TV. 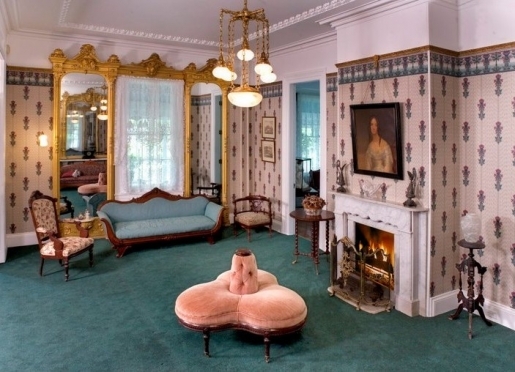 The sitting area includes a corner fireplace, comfortable antique settee, two straight backed chairs with a marble topped table, and floor lamp. A double closet holds the mini refrigerator. 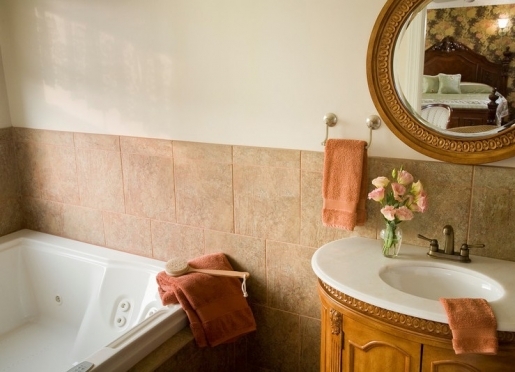 The bathroom is the size of a small room, has its own bay window, and features a two-person Jacuzzi Salon Spa tub with water jets, air bath, lights and heater, a double vanity with matching mirror, toilet, and two-person, double headed shower. 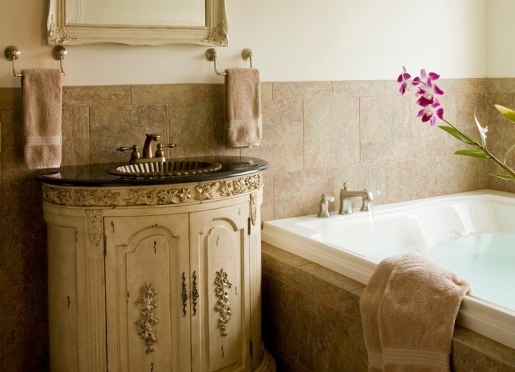 The bathroom is large enough to host in-room spa services, if desired. This suite has it all! An impressive third floor suite with a bay window plus two individual windows allowing maximum natural light. 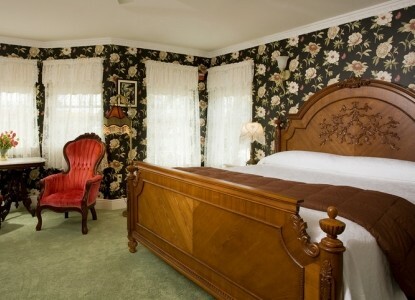 The suite is decorated with a wall covering made up of a black and white flower pattern with red highlights. 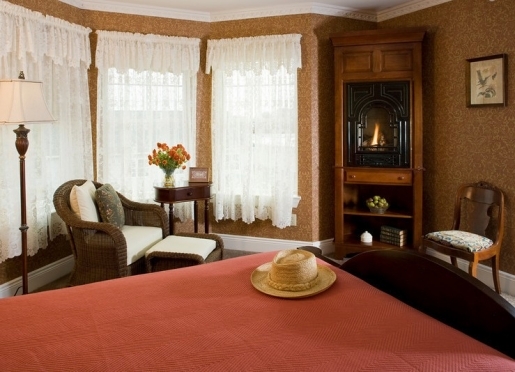 The room has a king sized bed with matching armoire, LCD TV with satellite TV and DVD player, and corner fireplace. The sitting area has an upholstered red chair, a red shaded floor lamp and an antique table with a marble top. A mini refrigerator is in the closet. The bathroom features a two-person Jacuzzi Salon Spa tub with water jets, air bath, lights and heater, a vanity with matching mirror, toilet, and two-person, double headed shower. >The third floor suite has a large bay window with brown tones in the pattern of the wall covering and carpet. The wood framed queen bed with matching armoire that house an LCD TV with satellite TV and DVD player add to the rich feel of this room. A wood corner cabinet houses the fireplace, and a brown rattan chair and foot rest, floor lamp and wood table complete the room. This suite has a comfortable, home like quality. There is a mini refrigerator in the closet. The bathroom features a two-person Jacuzzi Salon Spa tub with water jets, air bath, lights and heater, a vanity with matching mirror, toilet, and two-person, double headed shower. 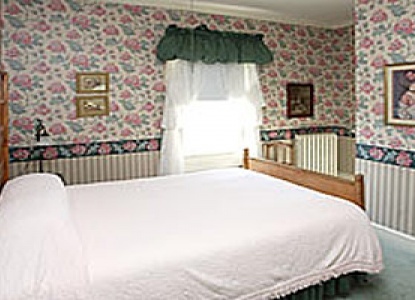 This queen suite on the third floor is decorated with white, pink and light green floral wall covering and green carpet. 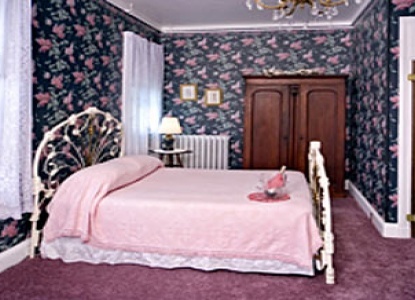 The suite includes a queen sized painted metal bed, pink and white upholstered chair, antique wood and glass table, bedside table with light, and a corner cabinet fireplace. The armoire has a bank of drawers at the base, and LCD TV with satellite TV and DVD player above. The closet hosts the mini refrigerator. The bathroom features a two-person Jacuzzi Salon Spa tub with water jets, air bath, lights and heater, a vanity with matching mirror, toilet, and two-person, double headed shower. >This third floor suite has a welcoming quality. The bay window highlights the green and orange tones in the wall covering, border and carpet. An upholstered chair and a straight backed chair, a floor lamp and a marble top chest make up the sitting area. 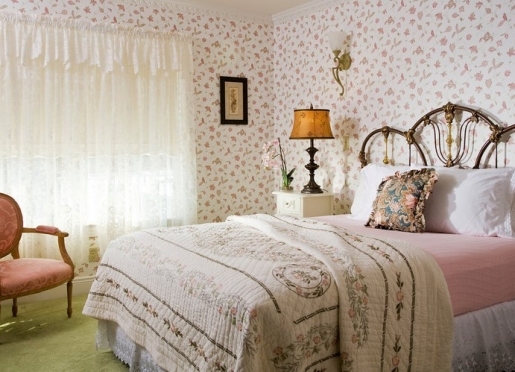 The queen sized bed has a metal painted frame, complemented by a bed stand with floral patterned light. The armoire has a bank of drawers below, and LCD TV with satellite TV and DVD player above. The fireplace is situated four feet off the floor in a cherry wood corner cabinet. A mini refrigerator is in the closet. The bathroom features a two-person Jacuzzi Salon Spa tub with water jets, air bath, lights and heater, a vanity with matching mirror, toilet, and two-person, double headed shower. 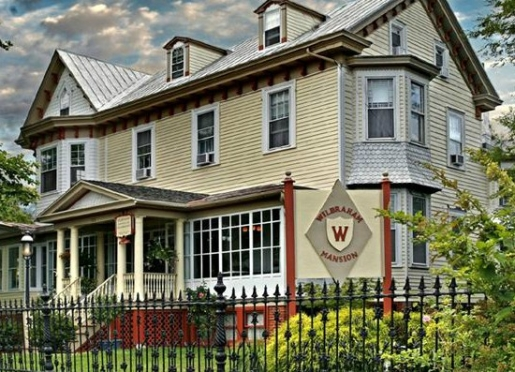 Thank you for making an inquiry about staying at Wilbraham Mansion Inn and Suites.